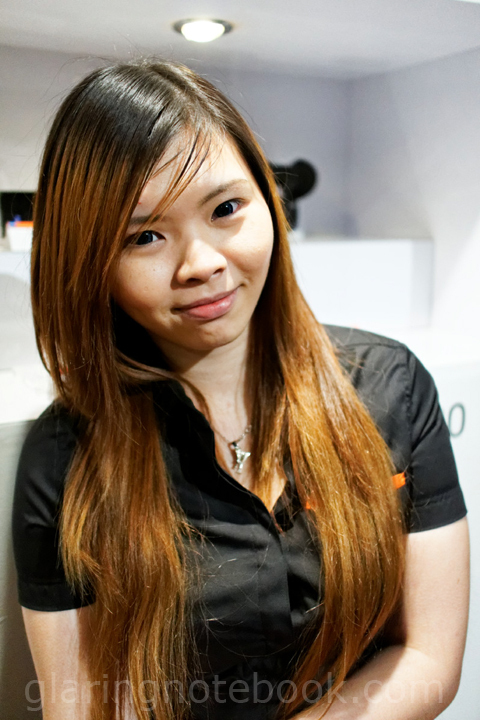 I was at the Sony Alpha SLT-A77, SLT-A65 and NEX-5N launch in Malaysia on the 24th of August 2011. 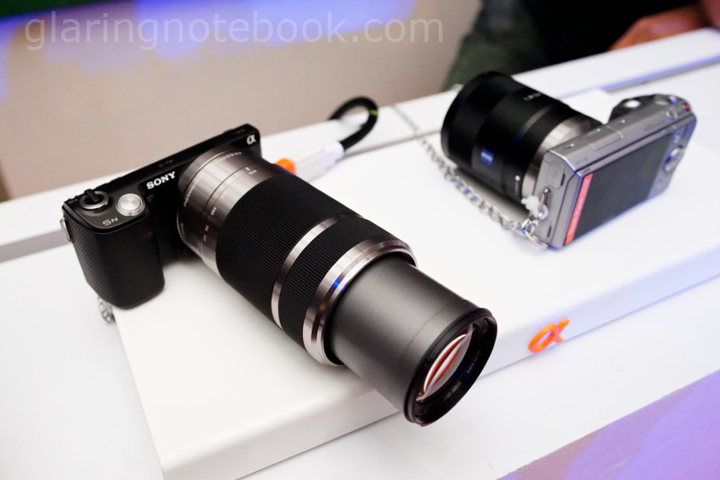 This entry covers the Sony Alpha NEX E-mount system. The lens on the left is the Sony E 30mm F3.5 Macro 1:1. I did not get to test it in better lighting. 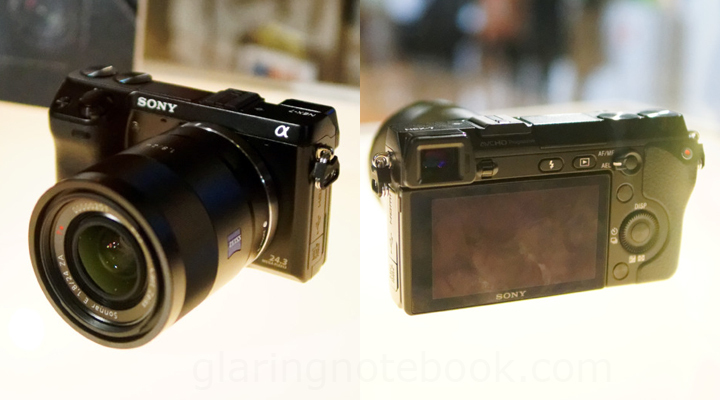 Here it is, a JPG from the new Sony Alpha NEX-5N, brightened in Photoshop. Sony Carl Zeiss Sonnar T* E 24mm F1.8 ZA, at F1.8. Why is it called a ZA lens anyway, when it is not an A-mount lens? Sony E 50mm F1.8 OSS, at F1.8. Left to right: HVL-F7S, HVL-F20S, HVL-F20AM. Pardon the flash gel on the F20AM! This is what it looks like on the camera. It has a wide/tele switch on one end and a bounce/forward switch on the other. 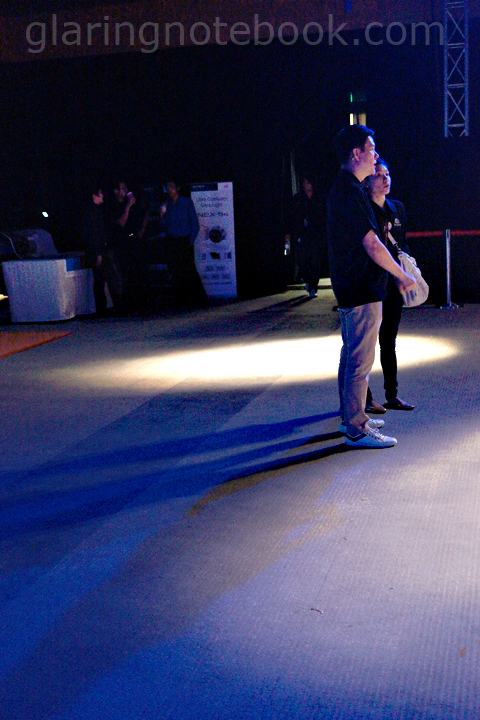 The wide-angle panel does not get in position when in bounce mode, a clever design brought from the HVL-F20AM. The lens is the Sony E Carl Zeiss Sonnar T* 24mm F1.8. It is smaller than pictures say and quite pocketable! It has this nice rangefinder lens look. Shot with the HVL-F20S. It can brighten half a hall! Shot at 210mm so you get the idea how far away the flash works. The HVL-F20S gives a guide number of 20 meters at ISO100, telephoto position (50mm). 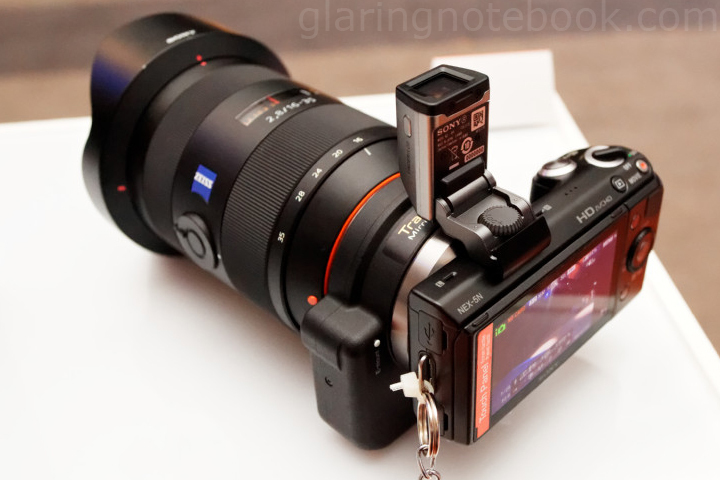 Best of all, it is already compatible with my NEX-5! 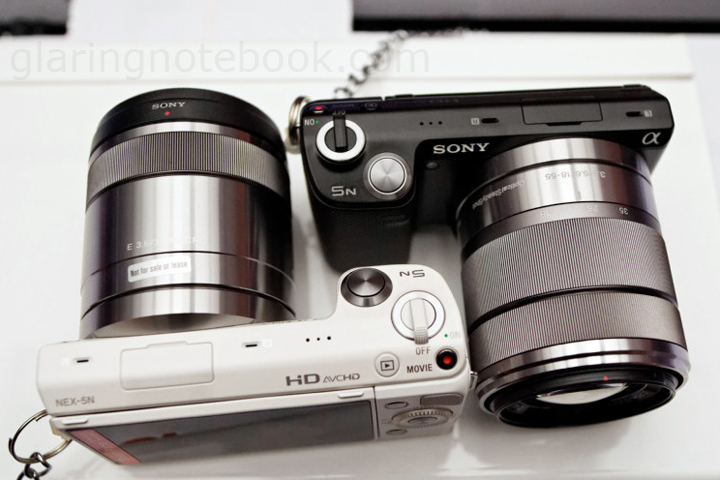 The Sony 50mm F1.8 DT SAM focuses to 34cm close, while the Sony E 50mm F1.8 OSS focuses to 39cm close. Another loss there. Fortunately the Sony Carl Zeiss Sonnar T* E 24mm F1.8 ZA focuses to 16cm close, better than the Sony Carl Zeiss Distagon T* 24mm F2.0 ZA SSM at 19cm close. The 55-210mm is rather handsome. A nice touch is that all the lenses have 49mm filter threads, except the Sony E 18-200mm F3.5-6.3 Active OSS! 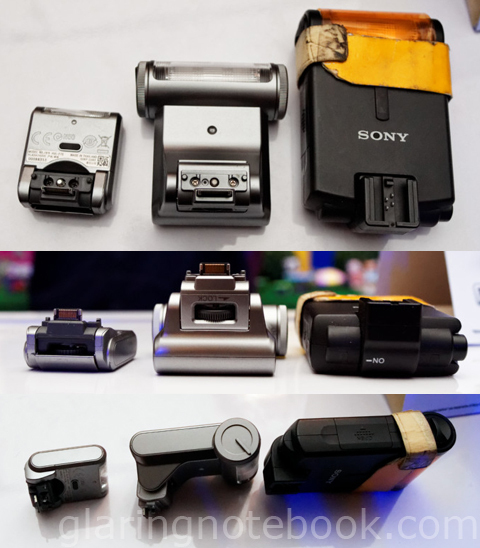 The FDA-EV1S is an electronic viewfinder that only fits on the NEX-5N. Why? 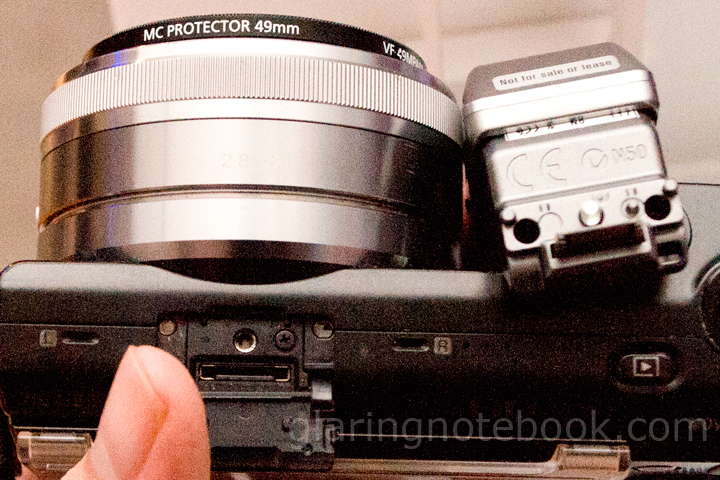 They blocked it off by adding a screw under the FDA-EV1S so it would not mount on my NEX-5! That said, even if it could, it would not be compatible as it uses the new Smart Accessory Terminal 2. 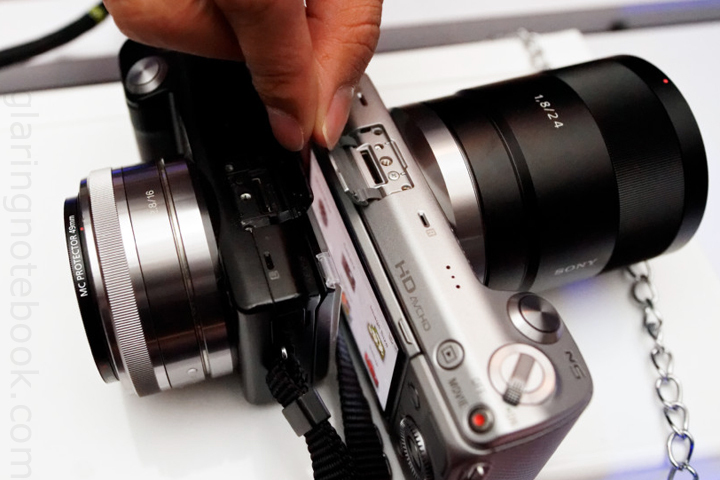 The NEX-5N has an extra hole for the screw. 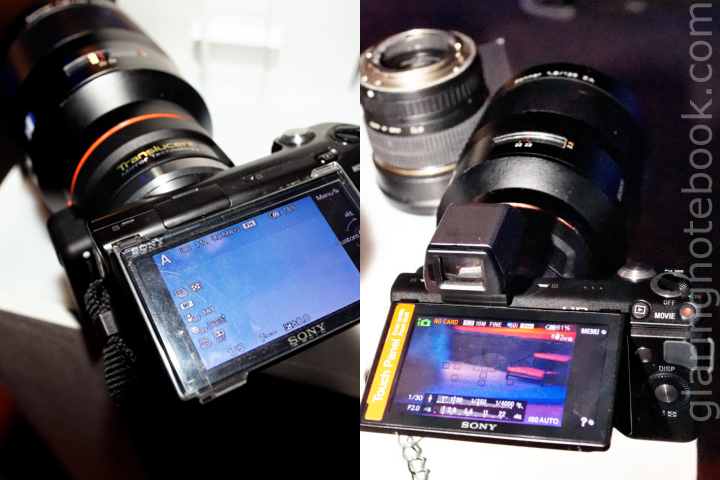 The new LA-EA2 Translucent Mirror Technology SLT A-mount to E-mount adapter, also isn’t compatible with my NEX-5 (yet). On the left, it shows no aperture reading, and does not autofocus. A future firmware update will allow the NEX-5 (and probably the NEX-3) to use the LA-EA2 to autofocus. I am very excited about this – the ability to use phase detect on a mirrorless camera is awesome! The ability to add a mirror to a mirrorless camera is even cooler. 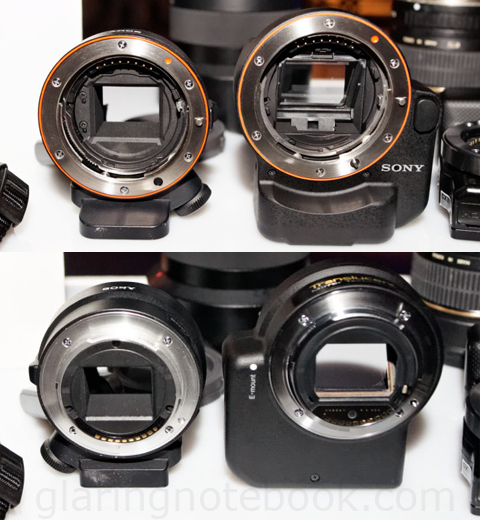 Left: The Sony E 50mm F1.8 OSS and Sony Carl Zeiss Sonnar T* E 24mm F1.8 ZA both have their apertures wide open when not mounted on a camera, which is the opposite from all other E-mount and A-mount lenses. Right: The mirror is upside down. Why wasn’t it that way on the A55 to begin with? This would avoid dust from landing on the mirror! 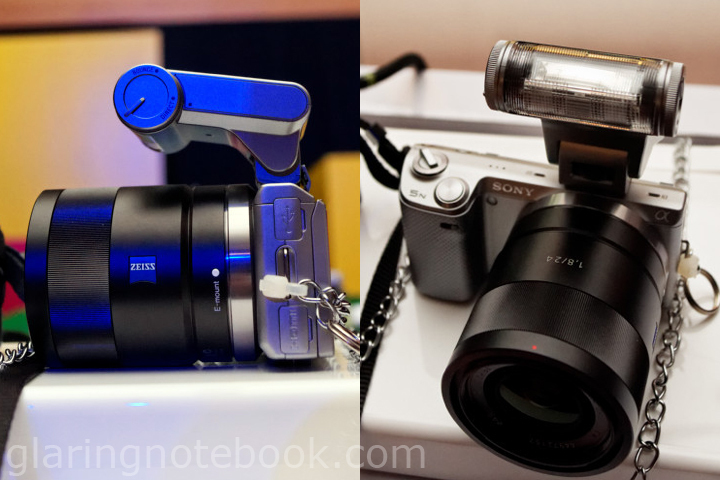 – The NEX-5N loses out by not being able to customize the Left action of the D-pad. 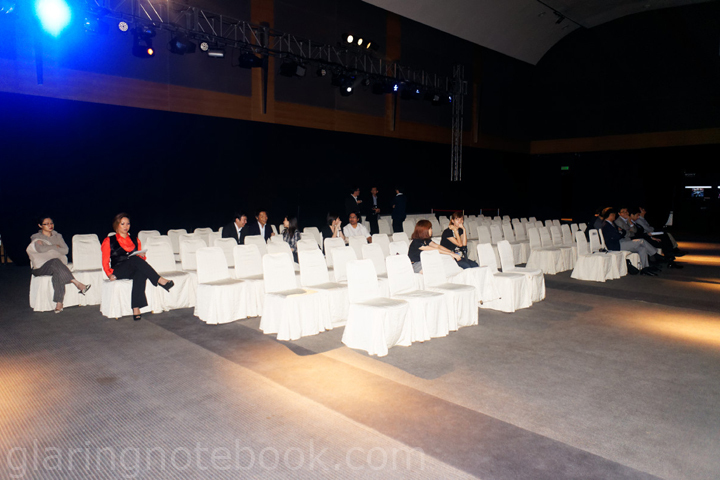 The NEX-C3 had such ability. 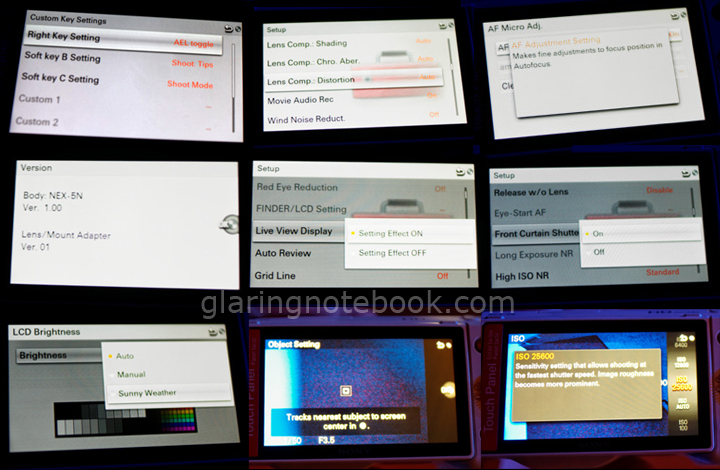 – Lens corrections are abundant even in the NEX-5N! – Wow, AF Microadjust! 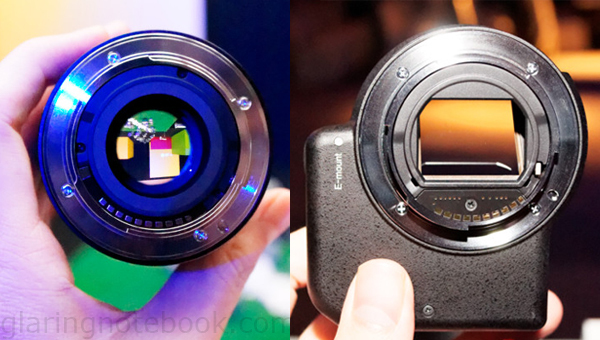 I can only hope this is there because of the LA-EA2 adapter, and I also hope they’ll put this in the new NEX-5 firmware. – Version 1.0 but is really not the final version. 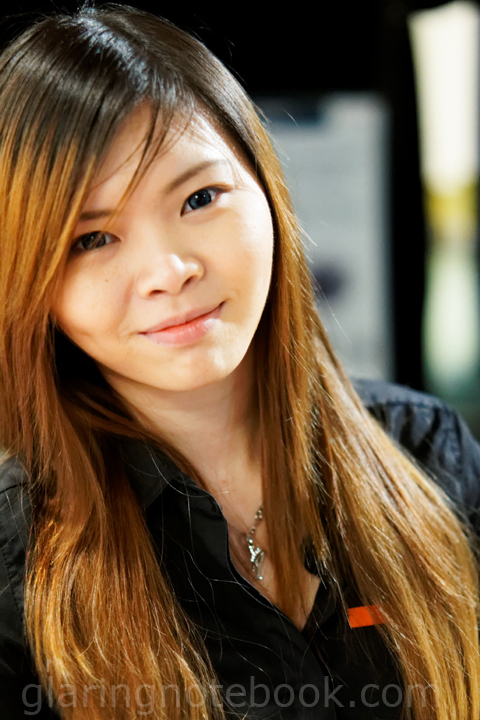 – Live View Display “Setting Effect OFF” allows auto-gain when using the NEX-5N in a studio. Though I don’t see how it would trigger a studio light other than the pop-up flash! – Front Curtain Shutter On allows for much smaller shutter lag. – LCD Brightness can be set to Sunny Weather – strangely, it was missing from the unfinalized SLT-A77 unit I tried, though my SLT-A55 has it. – Object Tracking is real cool. – ISO25600, better than the SLT-A77. Presumably allowed because it’s mirrorless. 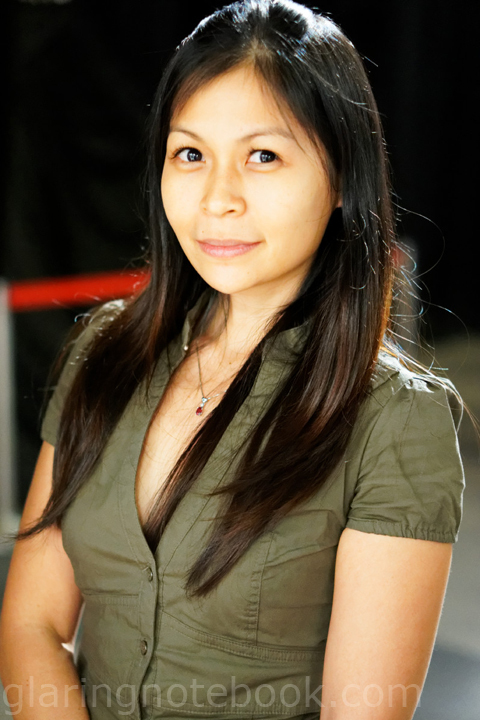 This entry was posted in Geek, Pictures on August 27, 2011 by 2konbla.